Ok, so this is history in the making! It is my first blog and it’s about two things I love, cooking and eating. Some of you might be asking, “Why beercanbbq.com?” Well it’s simple, I have a couple of friends that love my beer can chicken, so after a night of devouring a few chickens, the idea for beercanbbq.com was born. Let’s get started for real now. 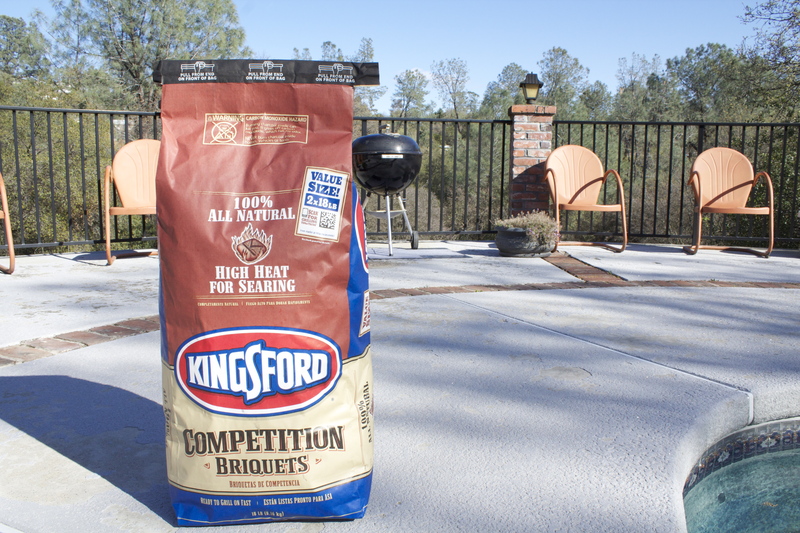 I prefer to cook with Kingsford charcoal on a traditional grill rather than a propane barbecue. I just think traditional grills give a better flavor. 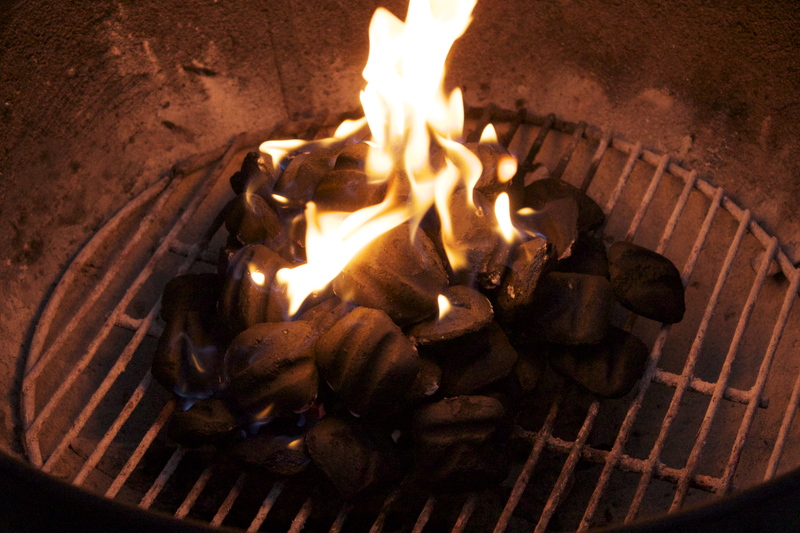 I also like to mix a few blocks of cherry wood in with the briquettes to add more flavor. If your not sure as to how many briquettes to use, grab an empty tin coffee can and fill it up. While I am waiting for the briquettes to heat up until they are white, I go back to the kitchen and start cleaning the whole chicken. I buy my chicken at a local meat market called, Wagon Wheel Market, but you can buy whole chickens at most grocery stores or your local meat market or organic chicken farmer. You start by cleaning the inside of the bird with lukewarm water. Make sure to press your fingers against the bones in the empty cavity of the bird and then rinse the bird really well again. After the chicken has been thoroughly cleaned, place it in a dish. I prefer a disposable tinfoil pan. Now you are going to get some olive oil and rub about 3 to 6 ounces of oil all over the bird. 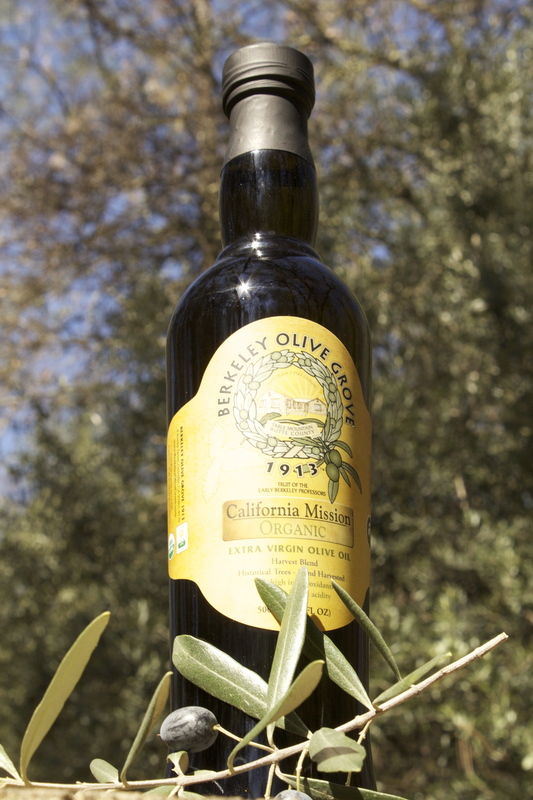 I prefer to use a quality local olive oil called Berkeley Olive Grove 1913 olive oil. The olive oil will make the chicken’s skin crispy all over which my friends, myself and my spoiled Shih Tzu all love. Once I’m done rubbing the bird down I grab some spice’s and sprinkle it all over the bird. Then just like you did with the olive oil start rubbing it into the bird. 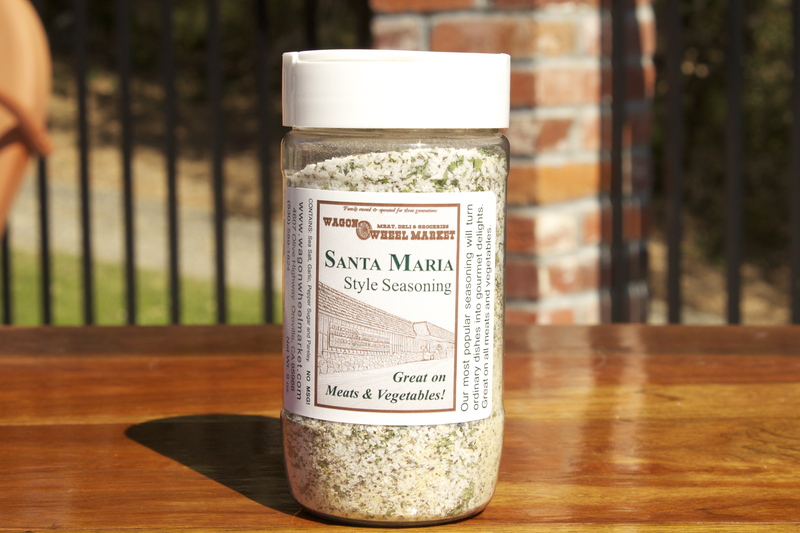 You can use a simple salt and lemon pepper mix or a favorite spice mix that you created or purchased. One of my favorite spice mixes is Santa Marie from the Wagon Wheel Market. Since you don’t have the Wagon Wheel right around the corner you can order it online or you can use your own. Now wash your hands and check on your briquettes. They should be ready. For my beer I like to use Sierra Nevada Pale Ale. I fill the Sittin’ Chicken Steamer with beer. Then I place the bird on the Sittin’ Chicken Steamer. Use the big opening that’s already in the rear of the bird. Do not cut your bird. Now its time to spread the briquettes. You want to spread them out so that they are on 2 sides of the grill. Don’t worry about the whole in the middle you don’t want the direct heat of the briquettes. 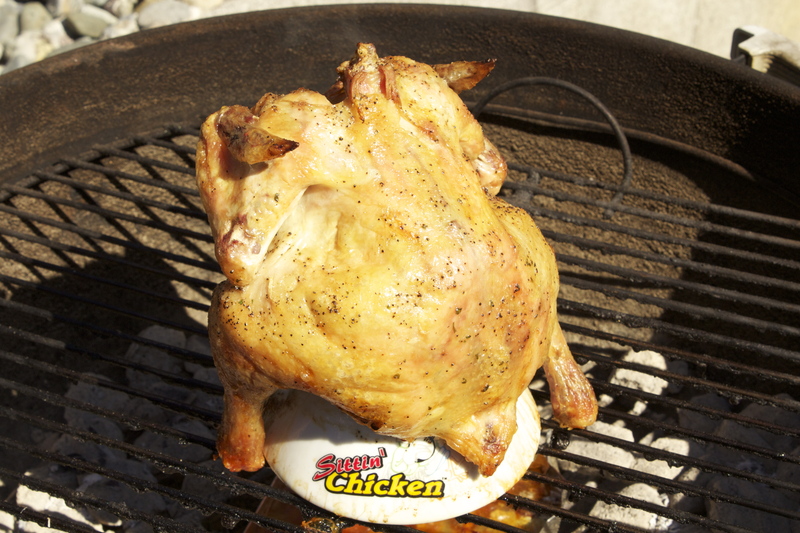 Put the grill rack in place sit your bird in the middle of the BBQ and wait for 1 hour and 20 minutes. When the time is up you will have the best beer can barbecue chicken ever, and your family, friends and spoiled dog will love it. Im glad that you find it interesting. This chicken looks so delicious. I miss being in a place that is surrounded by such great cooking resources. I remember that Wagon Wheel has the best marinated tri-tip and chicken. They also carry my favorite bbq sauce, J-Lee Roys. MMmmm. I’m going to try this chicken for myself as soon as possible and look forward to more recipes. Yes Oroville is surrounded by great cooking resources. Look for more in coming blogs. Thanks for reading and thanks for the comment. Great job on the blog I’m super impressed, also good job on the step by step instructions man I grabbed all the stuff you recommended and did my own and it came out amazing!!!!! Shane thanks for the feed back. I well make sure to add more pics. Yes Tiffany the picks are great. Thanks for your comment. Tiffanee the chicken taste better than it looks. Thank you for reading and thanks for the comment.